Juananne Wales loves to teach beginning quilters. She offers a beginners class that will walk the students through all the steps to complete their first quilt. Class size is limited so you will get lots of attention. If you are interested in a beginner's class in early 2019, please email the shop to reserve your spot. Juananne would love to teach you some techniques that she has learned as a longarm quilter that might help you enter the world of machine quilting. She offers several Machine quilting classes that are suitable for both the beginning quilter and those with some quilting experience. As a certified Square in a Square® teacher, Juananne has been personally trained by Jodi Barrows to teach her revolutionary method of quilting. By using special rulers and a little know-how, Square in a Square® quilters breeze through some of the most intricate geometric patterns. My client Eve Buterman made this lovely quilt and it was quilted by me. When Eve wanted to improve her skills, she worked through a Fon's & Porter book called "Quilter's Complete Guide". She completed all the blocks in the book and added a few of her own blocks to personalize her quilt. The quilt is stunning! I'm pleased to announce that my quilt shop "Farm Girl Quilts" is now open. We carry batting, fabric and other quilting supplies. Click "More Products" for the link. 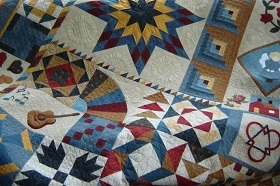 You can also follow Farm Girl Quilts on Facebook!